At the end of July, I attended my first ever conference where I had the chance to present my research to the larger research community for the first time. The biennial International Society for Justice Research (ISJR) conference took place in Canterbury - for 5 days researchers from all over the world gathered in this beautiful English town to discuss matters of social justice. Attending this conference at a time where racism and sexism, racism, and the like seem on the raise, it functioned as a reminder that there are in fact a lot of good people out there who care to make a positive difference to this world. At the end of the first day, my poster (see above, download below) was part of a "poster session": Researchers present their results on posters that are displayed within one big room. All conference attendants can look at the posters they are most interested in and can directly ask questions and give feedback to the researchers. These personal conversations often result in interesting discussions and ideas on how to proceed with the research. It is further a very good practice to explain and defend your research to peers. The research that I presented has kept me busy since March of this year. A theoretical model (will elaborate on this in another blog post soon) I developed required me to measure "Support for Gender Equality Among Men", however, I noticed that up to this point no such scale existed. Over the course of several weeks (I was surprised at how long this took, too...), I established a list of 31 items that are related to how men could support gender equality. I included some broader statements, and statements capturing the domains of public activism, dissemination of the thought of gender equality, reaction to gender inequality, support at the workplace, household chores, relationships, and parenting. Via an online platform, I had 322 men indicating their agreement with each of these statements. 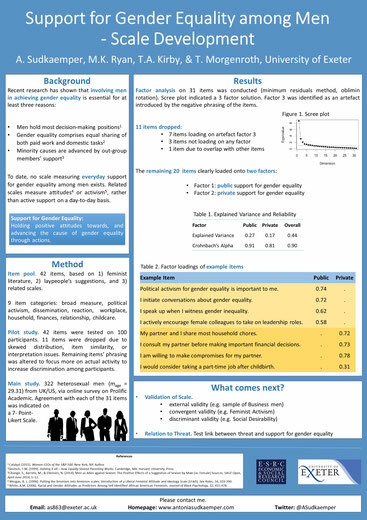 By the means of factor analysis (a rather difficult statistical procedure that investigates the relationship between the item responses...), I found out which items are not suitable to measure support for gender equality among men, and which items group together. Two big item groups emerged: One capturing the domain of public support for gender equality, and the one capturing the domain of private support for gender equality. The poster shows example items of each domain. The overall scale will hence have two sub- scales that can be used independently, depending on what one intends to measure. Currently, I am replicating these results with a different sample as it is important to show that the results did not just emerge by chance. Further, I am testing how my scale relates to other scales in the field, e.g. scales measuring sexism and feminism. After this, I will finally be able to test my original model using my own scale. Please contact me at as863@exeter.ac.uk if you are interested in more details, or if you are would like to use this scale for your own research!